Office roof gardens solve the issue of office space in congested cities, creating an extension of the work place for company’s that have minimal space but the luxury of a roof terrace or garden. Office gardens create more space, and diverse space, for both internal and external company meetings. 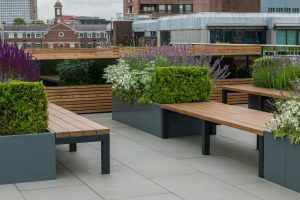 Aralia were commissioned to complete a roof terrace by a major company Shaftsbury PLC, owning a substantial part of the Carnaby Street & surrounding areas. The company had relocated its head office to these newly refurbished premises and were looking for a total refurbishment of the roof terrace space to match the high standard of the contemporary office interior. The roof terrace was to be used for informal internal meetings and staff breaks, as well as larger cooperate entertaining of up to 200 guests. The space would therefore need to be functional and flexible, offering practical space that can be easily adapted to suit various scales of use. 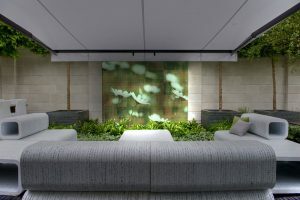 To provide this flexibility, Aralia provided an open roof terrace that was divided into private sections with bordered areas that could be used to make room for smaller informal meetings. Screening was introduced in the form of planting beds to keep privacy for these meetings, but Pleached trees or wooden structures can be used for a similar effect. An office garden offers a space that can easily adapt to suit different situations. For instance, our design for our RHS Chelsea Flower Show 2012 Award Winning Show Garden ‘Rooftop Workplace of Tomorrow’, included an expansive space that could be used for larger meetings. This is perfect then for smaller offices – or for offices that find their meeting spaces overbooked – as it offers an overspill space for meetings that don’t fit in the office themselves. In addition to this, the roof terrace or roof garden provides impressive views for meetings with external visitors. By adding a partially covered space – like the Contemporary Modular Cube Building we used in our ‘Rooftop Workplace of Tomorrow’ Show Garden – or a more simple Galvanised Steel Pergola (like the one used at Ganton Street) you can make the area usable all year round. Ganton Street Corporate Office Roof Terrace, Copyright John Glover, RHS Flower Show Garden 2012 ‘Rooftop Workplace of Tomorrow’, Copyright Aralia. With technological advances, outdoor spaces are no longer disconnected, but instead can have effective WiFi. TV Screen’s can be added into Office Gardens – like the LCD Outdoor Sports Screen we used here – to project figures or presentations, providing the perfect projection screen. Further, these screens can be used to display company logos or advertisements, alerts to keep staff up to date, or even inspirational quotes for staff. This kind of minor touch is so important given the ever-increasing emphasis on employee perk’s. Companies, including Google and Apple, are increasingly offering these perks to their staff, making it essential to stay up to date with your competition by following suit. A perk, like a rooftop garden or Office Garden, can drive up your company’s desirability and make the difference in scoring scouted employees over competitors. OR contact Aralia on 01279 721 461 or email info@aralia.org.uk to discuss your Office Garden or Roof Terrace.